Structure of the yeast proteasome solved by hybrid methods. Proteasomes are the cell's protein recyclers. Proteins need to be destroyed for many reasons: they may be damaged, or they may be part of an invading virus, or they simply may not be needed any more. Proteasomes provide a controlled method for breaking down proteins safely within the environment of the cell. They chop obsolete or damaged proteins into small pieces, about 2 to 25 amino acids in length. Most of these are then completely broken down into amino acids by peptidases in the cell. Since they perform their job inside a cell, surrounded by proteins, the protein-cutting ability of proteasomes is carefully controlled. The active sites are hidden away inside a cylindrical "core" particle, shown here in yellow and red. In our cells, three types of proteases (shown in red) are included in this core, with different tastes for particular amino acid sequences. At each end of the core, an ATP-fueled engine, colored magenta, unfolds proteins and feeds them into the core. On top of that, a large collection of regulatory subunits, colored blue here, recognize proteins that are tagged with ubiquitin and queued up for destruction. It has proven impossible (so far) to crystallize the whole proteasome particle, but many crystal structures have been obtained of the core particle. The earliest structures, for instance, from PDB entry 1pma (not shown), revealed the atomic details of the protease sites and the gates on either end. The structure shown here, from PDB entry 4CR2 , was created by integrating several sources of information on the intact proteasome, fitting these types of partial crystallographic structures into a near-atomic reconstruction of the proteasome obtained by analysis of 2.4 million images from electron microscopy. You can take a look at the cryo-EM reconstruction in entry 2165 at the EMDataBank. Proteasomes with two different activator caps. Many cells also make simpler regulatory subunits to cap either end of their proteasomes, that don't use ATP to power the pumping of proteins into the destructive core. The functions of these streamlined proteasomes are not entirely clear, but they seem to have more of a taste for shorter peptides and proteins that are normally unfolded. Two examples are shown here, from PDB entries 1fnt and 3l5q . Our cells also build specialized proteasomes for specific tasks. The one shown here, from PDB entry 3unf , is used during immune responses. When a cell is infected with viruses, it chops up the viral proteins and displays them on its surface with MHC, warning the immune system of the problem. A specialized proteasome, termed the immunoproteasome, is induced during the immune response and performs the cleavages. It is similar to the normal proteasome, but has three new catalytic subunits swapped into the core. One of these subunits cleaves the chain next hydrophobic amino acids, creating peptides that anchor particularly well to MHC. The illustration shows one ring of subunits, with an inhibitor (in turquoise) bound to the three catalytic subunits. To explore the immunoproteasome core in more detail, click on the image for an interactive Jmol. Structures are available for several other large protein-cutting machines, including HslVU, ClpP, tricorn protease, and DegP. Several proteins are required to chaperone the assembly of proteasomes. 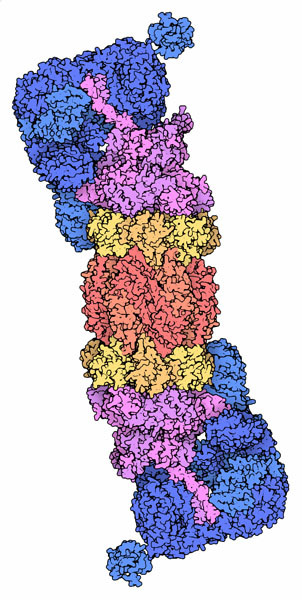 You can explore the structures of these chaperones by searching for "proteasome assembly." Some archaea make much simpler proteasome cores that have the same shape as ours, but are composed of only two types of subunits. You can look at an example in PDB entry 1pma. E. Kish-Trier & C. P. Hill (2013) Structural biology of the proteasome. Annual Review of Biophysics 42, 29-49. 4b4t: F. Beck, P. Unverdorben, S. Bohn, A. Schweitzer, G. Pfeifer, E. Sakata, S. Nickell, J. M. Plitzko, E. Villa, W. Baumeister & F. Forster (2012) Near-atomic resolution structural model of the yeast 26S proteasome. Proceedings of the National Academy of Science USA 109, 14870-14875. 3unf: E. M. Huber, M. Basler, R. Schwab, W. Heinemeyer, C. J. Kirk, M. Groettrup & M. Groll (2012) Immuno- and constitutive proteasome crystal structures reveal differences in substrate and inhibitor specificity. Cell 148, 727-738. 3l5q: K. Sadre-Bazzaz, F. G. Whitby, H. Robinson, T. Formosa & C. P. Hill. (2010) Structure of a Blm10 complex reveals common mechanisms for proteasome binding and gate opening. Molecular Cell 37, 728-735. A. L. Goldberg (2007) Functions of the proteasome: from protein degradation and immune surveillance to cancer therapy. Biochemical Society Transactions 35, 12-17. 1fnt: F. G. Whitby, E. I. Masters, L. Kramer, J. R. Knowlton, Y. Yao, C. C. Wang & C. P. Hill (2000) Structural basis for the activation of 20S proteasomes by 11S regulators. Nature 408, 115-120.